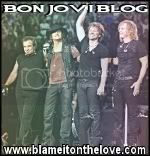 Bon Jovi Web Radio: SURPRISE FROM BON JOVI JANUARY 7 AT 7AM EST! SURPRISE FROM BON JOVI JANUARY 7 AT 7AM EST! Backstage JBJ members - get ready for a special treat from Bon Jovi! Come to BonJovi.com on Monday, January 7th at 7AM EST (New York) for a surprise. Also, be sure to check out the Bon Jovi app and join us as we continue the exciting countdown to new music!